MediaGuardian Fistful of Dollars article 2 November 2009 calls for taxbreaks for recruiters ??? « UK protectionism increases hindrance on developers hiring staff from outside Europe. MediaGuardian article 2 November calls for taxbreaks for recruiters ??? 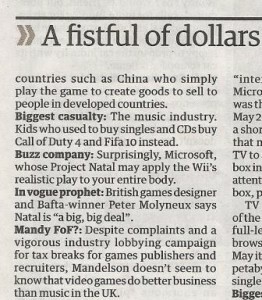 Recruiterblog welcomes the call for taxbreaks to go to UK recruiters as well as games publishers from the Gruniad. Recruiters are competing in the world market as much as anyone else.